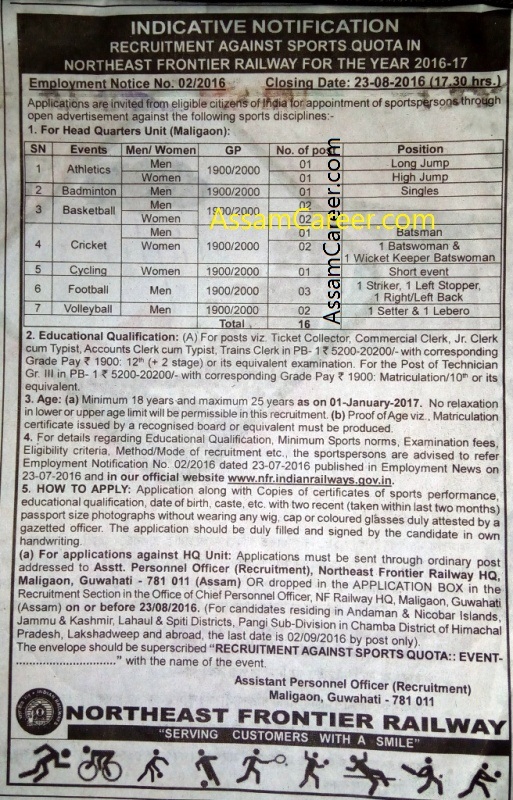 Northeast Frontier Railway, Maligaon, Guwahati invites applications from eligible candidates for filling up of the following posts of Sports Persons in various disciplines. Age : Candidates age should be between 18-25 years as on 01-01-2017. Educational Qualification: Candidates should possess 10th or/ and 10+2th or its equivalent. Pay: Rs 5200- Rs 20200, GP= Rs 1900/2000. Selection Process: Candidates will be selected based on Trail of Sports Performance, interview & assessment of sports achievement. Application Fee: Candidates should pay Rs. 250/- for SC/ ST/ Ex.Servicemen/ PWD, women,Minorities & Economic Backward classes only with a provision for refunding the same to those who actually appear in the written examination & Rs. 500/- for all other categories (non-refundable) by IPO should be drawn in favour on FA & CAO/ NF Railway, and payable at Maligaon Post Office, Guwahati-781011. How to Apply: Eligible candidates send their application on a good quality A-4 size palin paper in the prescribed format along with two recent passport size photographs duly attested by a gazetted officer, copies of all relevant certificates, experience & envelope should be superscribed with “Recruitment against Sports Quota:: Event_____” with the name of the event should be sent by ordinary post to Asstt. Personnel Officer (Recruitment), Northeast Frontier Railway HQ, Maligaon, Guwahati-781011 (Assam) or dropped in the Application Box in the recruitment Section in the office of Chief Personnel Officer, NF Railway HQ, Maligaon, Guwahati (Assam) on or before 23-08-2016 & for remote areas on or before 02-09-2016.